Today Internet allows you to create a nice website yourself, without any help of web masters or coders. For this you only need to buy hosting and use special CMS platforms that help you make a site using different modules, plug-ins and tools. This is like a constructor — you choose the functions you need, and connect them into a whole system. And this requires only a couple of clicks. One of the most user-friendly CMS platforms you can try is WordPress. In this article we’ll explain you, how to install WordPress in your hosting server without any commercial script libraries (like Fantastico) or other similar helpers. To install this CMS manually, you only need cPanel, which is usually included into hosting packages. The first step is, actually, downloading the WordPress zip file. You can easily find it at the official web page of WordPress — www.wordpress.org. After downloading the file that works with your operating system, you have to unpack it and leave it alone for some time. The next step is creating a database at your server. For this, login to your cPanel (the instruction for this is normally provided by hosting companies). Now, go to MySQL Databases and create a database with preferred user name and password. Then you have to link the User with Database and give the user all available privileges (i.e. rights) for working with the newly-created database. The next stage consists in adding the details of the database to wp-config file. 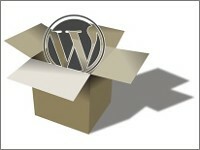 For this you have to find the wp-config-sample file in the WordPress folder you unzipped. Rename this file to wp-config, and open it. Now you can add the name of your database, the name of user and the password to the file. Now you have to upload to root the contents of the wordpress folder you have unzipped a bit earlier. Use FTP to go to the public_html/pascal.co.cc folder on your server, and upload all files to it. This may take some time. Finally, run the installation by going to www.something.com/wp-admin/install.php, where something.com is the address of your site. Finally, when the installation starts, you’ll have to fill up the site title and tagline. When the installation is over, you’ll see a special information window. In this window you’ll find the admin username, and the password you chose. So, we hope our instruction helped you well to install WordPress on your hosting server. Now you can check web for interesting WordPress themes that will make your site look stunningly beautiful — whether it’s a blog, an eCommerce site or whatever else.